At the beginning of the Great War, assault units did not exist. If one was to compare the Caslow assault detachment (Sturmabteilung Caslow) with the Rohr assault detachment then battalion (Sturmbattalion) which succeeded it, it is easy to maintain that the former - an experimental detachment - gave rise a year later to the latter, a remarkable combat and training unit. 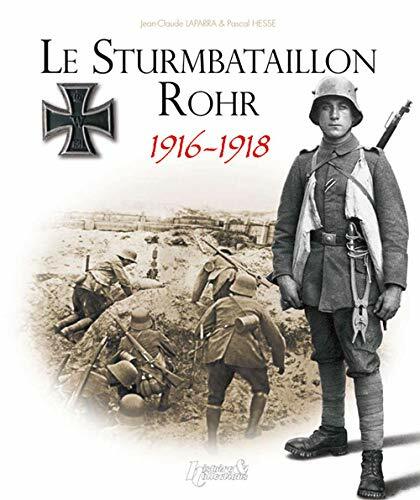 The book supplements existing works on the subject of the Sturmbatallion Nr 5 (Rohr) and offers among other things an exceptional number of illustrations in a small format, which has never previously been available. Indeed, it allows a closer look at this assault unit, showing different aspects over a period of about three years. The text is drawn from the account written by Schwerin and a number of other sources. It particularly studies the circumstances in which the unit's fighting took place. At the beginning of the Great War, assault units did not exist. If one was to compare the Caslow assault detachment (Sturmabteilung Caslow) with the assault detachment then battalion (Sturmbattalion) Rohr which succeeded it, it is easy to maintain that the former - an experimental detachment - gave rise a year later to the latter, a remarkable combat and training unit. The book offers among other things an exceptional number of illustrations in a small format. Indeed, it allows a closer look at this assault unit, showing different aspects over a period of about three years. The text is drawn from the account written by Schwerin and a number of other sources. It particularly studies the circumstances in which the unit's fighting took place.